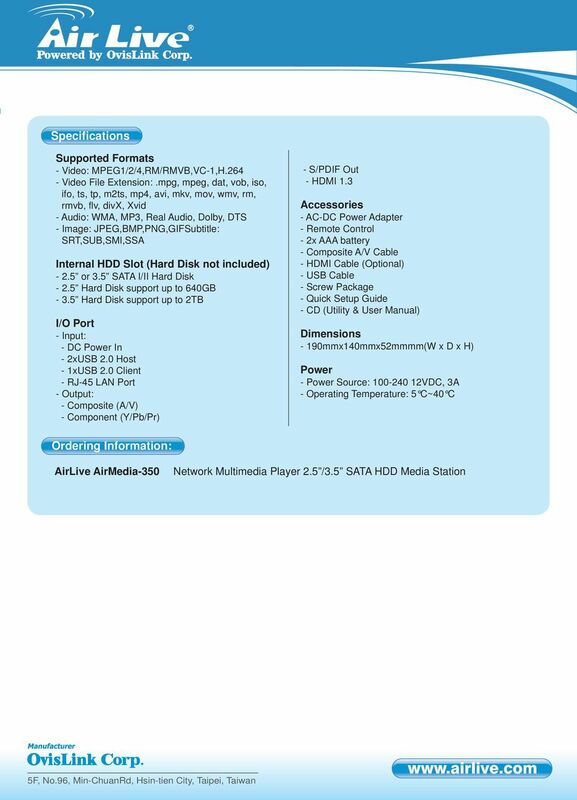 AirMedia Network Multimedia Player 2.5 /3.5 SATA HDD Media Station HDMI. USB Host x2. USB Client x1. Wi-Fi (Optional) 10/100 Mbps. 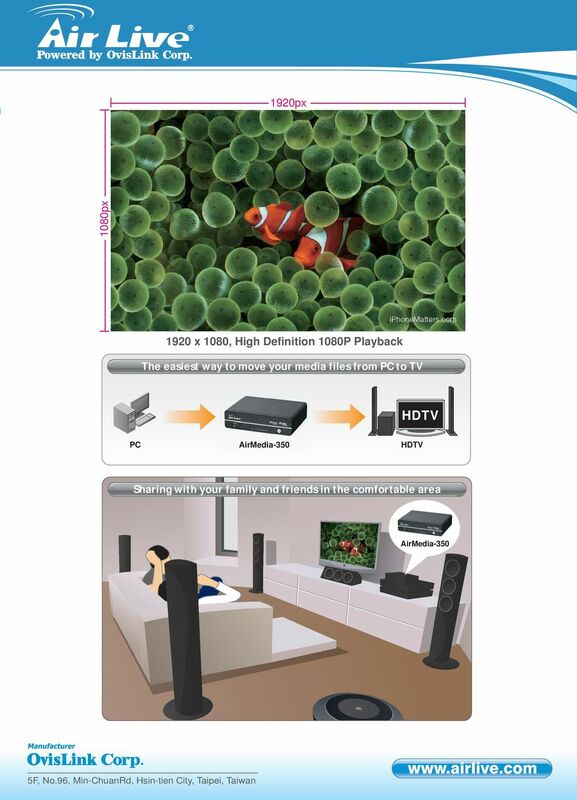 Download "AirMedia-350 1.3. 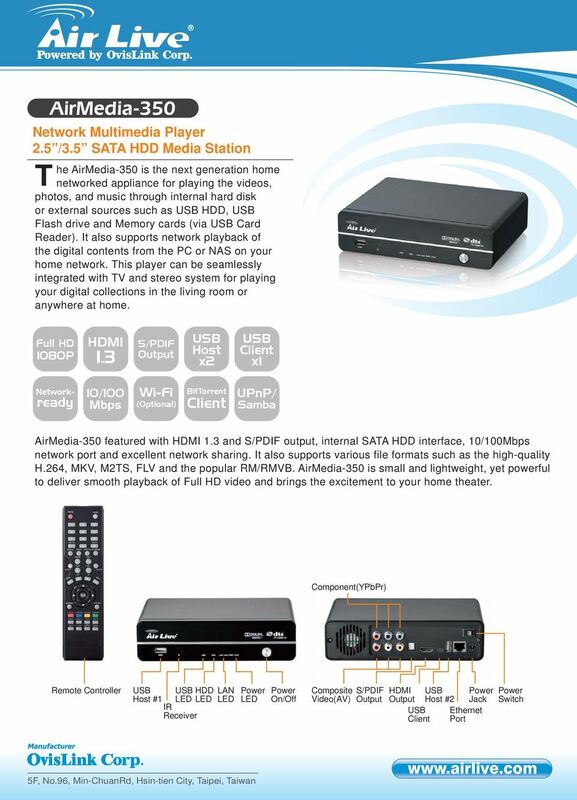 Network Multimedia Player 2.5 /3.5 SATA HDD Media Station HDMI. USB Host x2. USB Client x1. Wi-Fi (Optional) 10/100 Mbps." 2 BitTorrent Client Built-in Bit-Torrent download engine, this engine allows you to download the legally shared contents on the Internet without leaving your PC power-on all the time. Internal Disk Drive Bay AirMedia-350 is capable of installing a 2.5-inch or 3.5-inch SATA hard disk with the capacity up to 2TB. With the internal hard disk firmly installed, your AirMedia-350 is now a Home Media Center with file storage and sharing capability. Furthermore, AirMedia-350 can be treated as an external hard disk enclosure for easy file access and quick transfer through PC by connecting the cable to the client port (mini port) at the back panel. 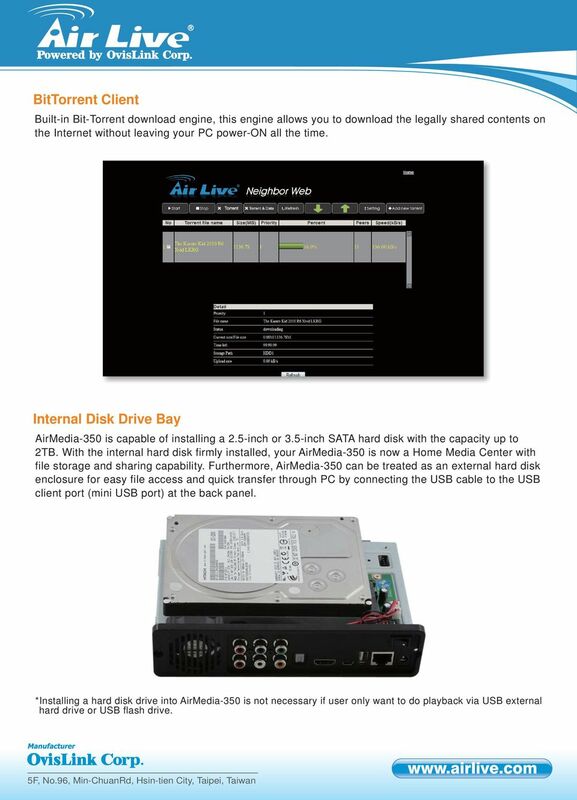 *Installing a hard disk drive into AirMedia-350 is not necessary if user only want to do playback via external hard drive or flash drive. Streaming & Android TV Box. The TV Box. All the freedom of Android and Internet on your TV! Go-digital Sale & Rent GmbH Seebadstrasse 16 A-5201 Seekirchen Telefon +43 (0) 650-4514371 email: juergen.messner@go-digital.at. Suddenly everyone wants to sit in the back. IP65 Rated Outdoor Monitor User s Manual Manual Version OWTA1.0 Safety Instructions Please handle with care so as to not damage the LCD panel. The holes or openings on the display are designed for ventilation. Upgrade your possibilities Get the world of Android on your display Plug into a world of possibilities Now you can promote your products and services in a way that will captivate and impress your customers. 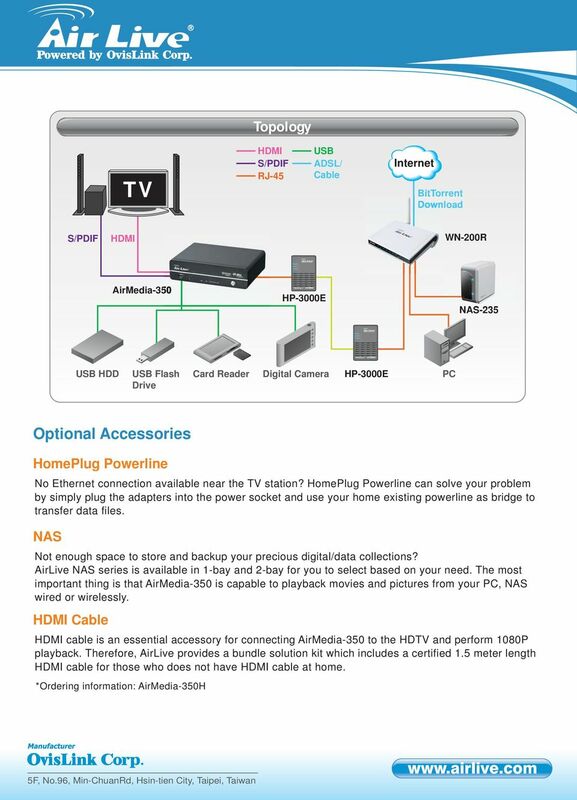 The revolutionary new system that distributes audio, video, control, telephony and data around your home. Acquire Video Wall. Revolutionising digital interaction. For Powerful Digital Marketing and Total Multimedia Solution DV-68 User s Guide HW Version 1.6 / FW. Version 2.0B2 Rev. 5 Acknowledgements The MedeaWiz logo and DV-68 are trademarks of MedeaWiz Corporation.